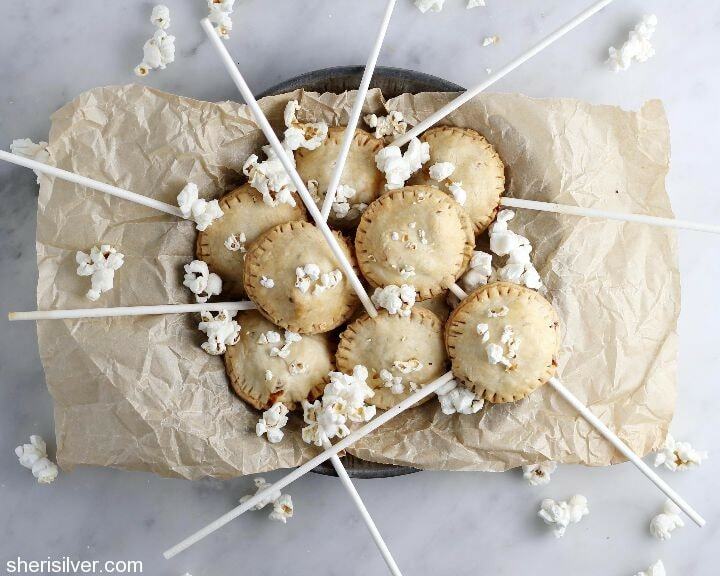 It’s no secret that I love love love popcorn – so when I saw these pie pops over at Sugary and Buttery (is that the best blog name ever or what? ), I knew it was only a matter of time before I tried them. I used my fave shortcut refrigerated pie crust and whipped up a half-batch of Smitten’s salty-sweet caramel corn. 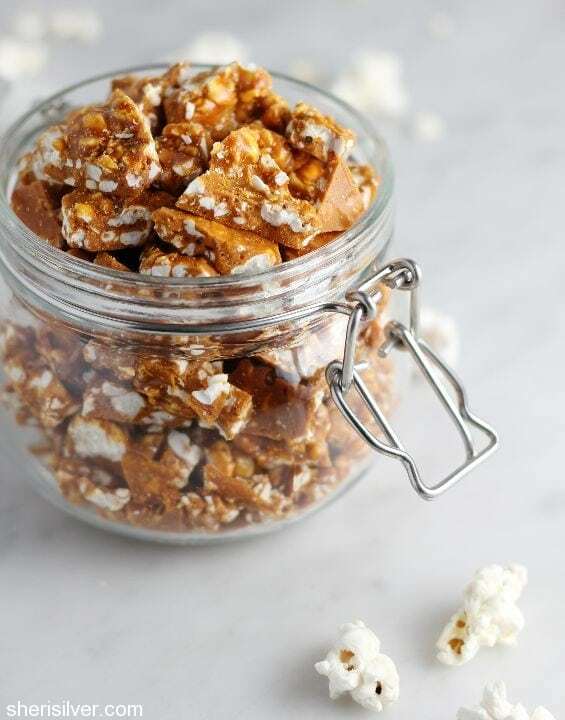 Note: The tiny pieces of popcorn create more of a “brittle” than the traditional caramel corn. Not a bad thing AT ALL. And you will have a lot of this brittle left over. Which wouldn’t be the worst thing to happen to your week, either, IMO. Pre-heat oven to 350; line 2 baking sheets with parchment paper. 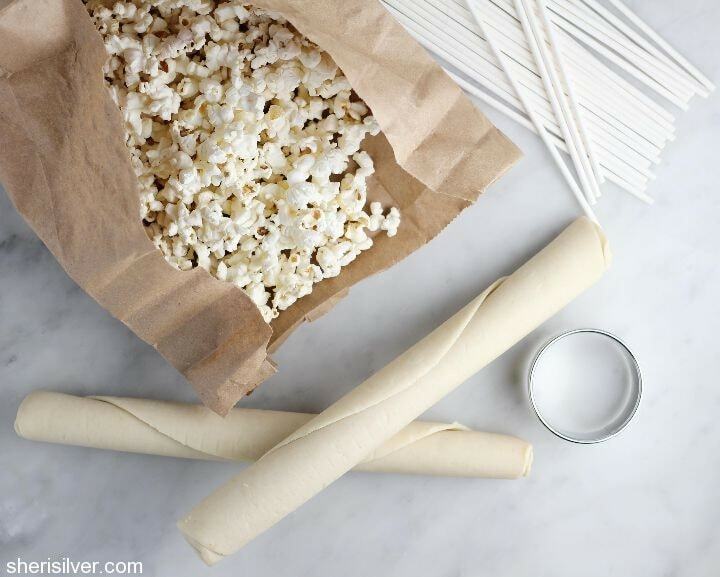 Place the popcorn kernels in a paper bag and fold the top over 2 or 3 times. Microwave for 2 – 3 minutes, shaking the bag halfway through and removing when popping begins to slow. Break up about 2 cups of the popcorn into small pieces and place in a large bowl. Cut 20 circles from your pie crust, using a 2 – 2 1/2″ cookie cutter. Place half the circles on one of your prepared baking sheets and press a lollipop stick gently in the center of each circle. Combine the sugar, butter, salt and water in a small saucepan. Cook over high heat, without stirring, until the mixture becomes a light golden-yellow caramel, about 10 minutes. Remove from the heat and carefully whisk in the baking soda (the mixture will bubble up). Pour mixture over the popcorn and quickly toss to coat. Immediately spread onto your other prepared baking sheet and let cool. When hardened, break into small pieces. 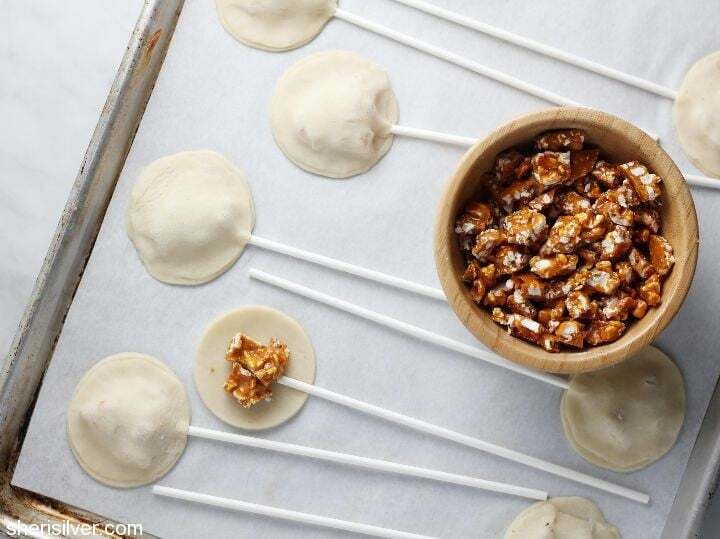 Place a few pieces of caramel corn into the center of each circle and brush the edges with a bit of the beaten egg. Top with the remaining crusts and crimp to seal. 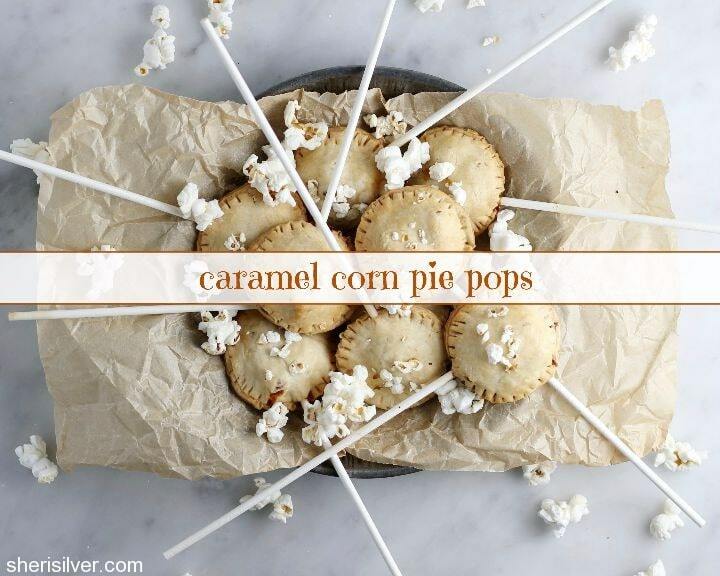 Brush tops with some more of the egg and sprinkle with a few popcorn pieces if desired. Bake for 20 – 25 minutes or till golden brown. Let cool on a wire rack. Need more popcorn? Check out these recipes!